Air Travel With Dogs - Come Fly With Me! No dog has to be left behind now that air travel with dogs has become quite acceptable and commonplace. Whether you're moving across country or just off on vacation, you'll be free to discover many more horizons when you travel with you dog by air. And, don't worry, your dog will get much better treatment than the doggie on the left!! Although airline travel with pets does require a little more pre-planning, most airlines have extensive information on their websites to help you prepare. Pet travel requirements vary from state to state and internationally, but in most cases health certificates are needed. If you have a dog that is a miniature breed, they can usually travel with you in the cabin on domestic flights. But bear in mind that the airlines only allocate a small number of spaces for "in cabin" pets on each flight which get snapped up early, so it's wise to plan ahead. Also, to travel in the passenger area, your dog must be small enough to travel in airline approved dog carriers that fit under the seat. This extremely popular Sherpa pet carrier has an impressive guarantee that offers to reimburse flight costs if you are denied boarding when using their carrier! It comes in three sizes, designed to fit pets in a weight range from 8 to 22 pounds. Check the guarantee details here . The size and total weight of carriers permitted does vary between airlines, so this is important information to verify with your chosen airline. 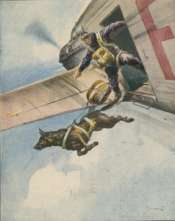 During the flight, your dog is not allowed out of the carrier. Pre-flight meals should therefore be planned well ahead of departure allowing your dog a chance to do his business prior to boarding. Larger dogs can travel with you on the same flights, but they must be housed in the cargo area. They are also required to be in airline approved dog crates. 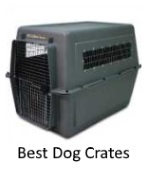 These type of crates are non-collapsible and ones in which the dog can stand up, turn around, and sit erect without touching the top of the container. The crate must also have food and water receptacles that are accessible from the outside. For domestic travel you will find very comprehensive airline information at nwa.com. British Airways is my personal choice for dog air travel if your destination is within their routes. They have years of experience transporting pets and their passenger service is excellent. You can make your reservation through Travelocity (see form above) and receive Special Savings on Travel, plus they have great last minute deals! In the case of travel to Europe, your dog will have to meet the requirements of the Pets Travel Scheme. Under this program, you will need to plan your trip at least 7 months ahead of time to allow sufficient time for steps that must be completed by your Vet, but don't worry, it's not difficult. Full details of this procedure are available at the airlines and most vets are familiar with the requirements. Although traveling by air domestically or abroad requires a bit more pre-planning, it's really not difficult. People with show dogs do it all the time. On a final note, if you have a dog that doesn't enjoy traveling, consider hiring a pet sitter so that he doesn't have to leave his familiar surroundings while you're gone. If you'd like even more information about pet travel, here's another website that covers the topic very well. So what are you waiting for, break out the travel maps and let your dog point his paw at a vacation destination! Doggie Clothes For The Jet Set. Make It Easy On Yourself and Your Pet!